This reminded me about the “Lipstick Index,” a term coined by an Estee Lauder chairman of the board who claimed that inexpensive lipstick sales are inversely correlated with the health of the economy. Before the Lipstick Index, there was the Hemline Index, which hypothesized that women buy shorter skirts during recessions. There’s now a Heel Index, that hypothesizes that women buy higher heels during recessions. The rationale behind these indices are more than a little sexist, but I won’t get into that. I’ve always been skeptical about whether the lipstick index is true. In the stories I’ve heard, the chairman of the board didn’t base his lipstick theory on data, and if he had, it sounded like he had a single data point (the early 2000s recession). If lipstick and economic growth are uncorrelated, that easily could have been a coincidence. Evidence from previous recessions seemed to be built on hearsay rather than facts. I wasn’t convinced. L’Oréal’s early-recession growth did not continue past 2008. For the first quarter of 2009, L’Oréal’s year-on-year global same-store sales shrank by 4.3%. Overall in 2009 — which was a much worse year of the recession, for consumers, than 2008 had been — sales fell by 1.1%. Data collected by Kline & Company, a market-research group, show that lipstick sales sometimes increase during times of economic distress, but have also been known to grow during periods of prosperity. In other words, there is no correlation. But that will not stop the hunt for more measures that may reflect economic confidence, or lack of it. 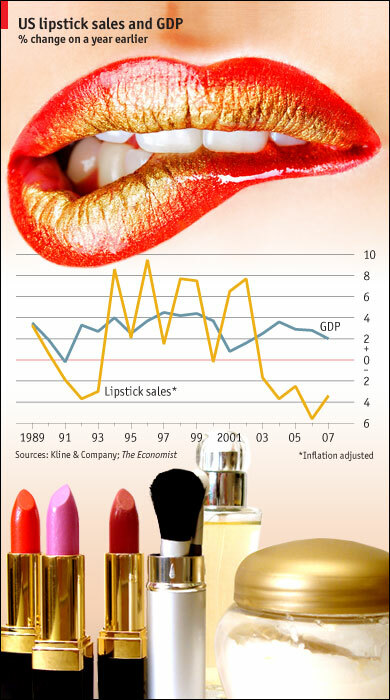 The Economist also provides the image to the right that shows that lipstick sales go up and down, and they were down during the 90s recession, have been down since 2003, and have been up and down during times of good economic growth. Time magazine reports on the lipstick index and then attributes the nail polish fad as the new lipstick index. Again, I don’t see a pattern here. Certainly, there are fads even during a recession, but that in itself is not evidence of a pattern. (3) almost all cosmetic sales are up when the economy is good and there are also fads during these times that boost sales. The Lipstick Index theories are not consistent with these observations. It just seems to me that people observe how other journalists discuss the Lipstick Index and then make the choice to likewise discuss lipstick, independently of their own private information signals about cosmetics. A cascade develops, then, when people abandon their own information in favor of inferences based on earlier people’s obsession with the lipstick. Certainly, there are some industries that boom when the economy is bad — apparently people buy safes during recessions — it’s just that lipstick isn’t one of these industries. Most of the top commenters on this blog are men who presumably do not purchase or wear lipstick, so I won’t ask about your lipstick purchases since late 2008. Instead I’ll ask about trends during recessions that may have some truth behind them. This entry was posted on Monday, October 22nd, 2012 at 7:17 am	and posted in Uncategorized. You can follow any responses to this entry through the RSS 2.0 feed. Serious comment first: while I have no idea if the “lipstick index” has any merit, I think that comparing time series of sales to GDP works better if you partial out components of sales explained by other factors. In particular, although it’s not included in your figure, in the late 60s to mid 70s (in the US) the “peace and love” generation shied away from makeup. (At least females did … the males, myself excluded, I’m not so sure about.) So there may be similar cultural trends present in the more recent data that could swamp the connection to GDP in a plot. Now, as to your last line, be careful what you wish for. The lipstick index may gloss over more pertinent factors. Your post paints a face on the role of analytics. There’s a pretty compelling argument (though I can’t point at real data right now) that the whole of the mainstream media operates on information cascades. One recent high-profile example was assessment of the candidates’ performances in the first debate. Early reactions and snap polls seemed to indicate that Romney “won” on points, but not decisively (except at MSNBC). The narrative of the President’s “cratering” caught hold only over the next few days. Eventually, though, that became the received wisdom and was reflected in polling. Similar effects can be seen looking back to previous elections. (Remember “Al Gore claims he invented the Internet”? I love that “I can see Russia from my back yard” is attributed by most people to the real Sarah Palin, even though the line belongs to Tina Fey’s parody.) You see campaigns trying to drive their narrative to dominance in the “spin rooms” after the debates and in every ad, event, and press release. I’ve also seen men’s fashion magazines repeatedly claim that suits are now being made in more fitted cuts due to the recession. Apparently style reporters want us to believe that looking good and having money are inversely related.